Written for 'Trek n Tent'. The Fell Club magazine. 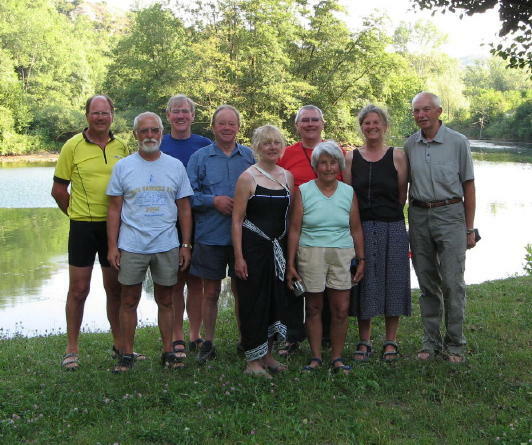 Mountains, Gorges and Fantastic Scenery will be the lasting memories of the ten Fell Club members on this cycle camping tour led by Pat and Mike Strauss and organised through the CTC. There were two options for the tour, most FC members took the 3 week option but due to home commitments some were limited to joining up for the last 2 weeks. The tour commenced with a Bike Express bus trip to Orange from where we cycled on the Sunday morning to our first campsite for 3 nights at Vaisson. Here we met up with Maggie Renn and Richard Clark both having travelled out earlier. The next day I accompanied Alan Routh on the climb up to the top of Mount Ventoux having said only 8 months earlier; “never again”. It was a tough ride in very hot conditions but these are forgotten with the elation of reaching the top. Tuesday I accompanied Maggie on an easier ride, around the local countryside, vineyards and villages. We moved on to hillier countryside and the second campsite at Lachau on Wednesday. Lucy Bentley rode with me as we climbed through the sweltering hot but beautiful Gorge du Toulourenc. 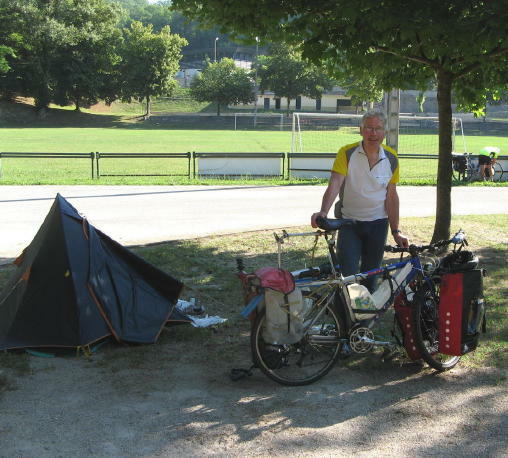 We spent 4 nights here visiting Sisteron and climbing some of the Cols and Gorges in the area. Col St Jean, Col de Perty, Col de l’Homme Mort and George du Meorge, to name a few. Sunday saw us moving down the Gorge de Ouveze to Buis les Baronnies and a link up with those on the 2 week option. Next day Bronwyn Bennett and I tackled another 3 Cols on a circular ride while Julian White went off to climb Ventoux, arriving back at camp with a treasured badge denoting his success. After 2 nights we moved on to la Motte with a tough early morning climb out of the gorge up the Col de Ey. Then on through the Eygeues Gorge passing the hill top town of St May. It was a little worrying to see the many Vultures gliding overhead, keep moving and look alive was the order of the day. Leaving here we headed over the Col du Premol to Die for 3 nights., on the way visiting the famous Claps stones. The town of Die was in festival mood to celebrate Transition, the time when grazing animals are moved up to the high pastures. Many of us took the day off the bike to experience the town in carnival mood. The next day it was back to climbing with a circular ride via the Col des Pennes and it’s winding descent. On Monday we moved on to Villard de Lans via the famous Col de Rousset, the toughest climb yet with a fully loaded bike. After passing through the summit tunnel at 1300 metres the terrain opens up into a most beautiful green valley. It’s hard to imagine that this was the area of some of the fiercest resistance fighting during the war. With many, including nurses and doctors tending wounded, being summary executed because of resistance activities. The best however was reserved for the final climb through the Gorge de la Bourne to Villard. 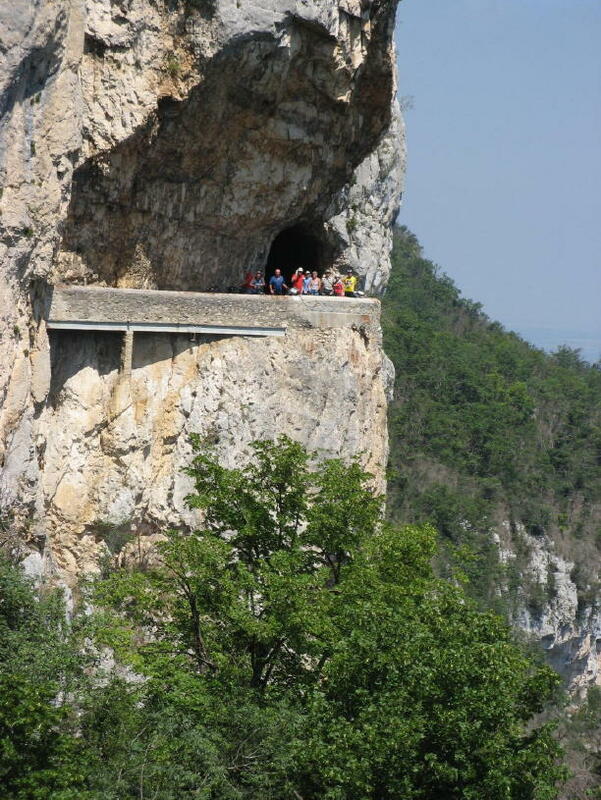 This has to rate as one of the best gorges in France. The next day I accompanied Peter Turney on a ride up to the ruins of Valchevriere. This village was destroyed and it’s inhabitant slaughtered by the SS as a reprisal for resistance activity. It is now kept as a memorial to those who lost their lives. It was a very moving site as only the Chapel remains intact. Next day while others went on the recommended ride, I took the opportunity to ride to see the Resistance Cemetery at St Nizier and sample the spectacular view over Genoble and the Alps. Thursday saw us coasting back down the Gorge de la Bourne to our last campsite at the very old town of Pont en Royans. From here we went on a ride up the Col du Machine and through the famous Combe Laval, a road carved into the side of the mountain 1000 metres above the valley floor. This was truly a breathtaking ride. Saturday saw some of us tackle the steepest climb yet up to the village of Presles before returning to Pont en Royans to witness England being beaten by Portugal. As this was our last evening a nice buffet supper was organised by the tour leaders, and we all had our fill. Next morning the campsite was a hive of activity as we all packed up our gear for the journey home. That is all except Richard who was going to continue with a solo tour through the Alps on to Italy. After the mountains the ride back to the pick up point at Valance was far less strenuous as we passed through the fertile terrain bordering the River Rhone. The Bike Express arrived an hour early and we were soon on our way back to England and the end of another good tour. Group photo left to right: Julian White, Alan Routh, Alan Lord, Peter Turney, Bronwyn Bennet, Stuart McDonald, Lucy Bentley, Maggie Renn and Harry Burton. Photo 2: Lucy Bentley demonstrating the art of map folding to Alan Routh. Photo 3: Richard Clark getting ready for his journey through the Alps to Italy. Photo 4: A group including Bronwyn, Harry, and Stuart of the Fell Club, on the high Combe Laval road.